Three apprentices from John Deere’s Ag Tech and Parts Tech training programmes – two from the Midlands and one from Kent – have won awards in Babcock’s annual Automotive Apprentice of the Year competition, designed to identify the best and brightest apprentices in industry. A total of 24 apprentices from across the UK competed at the Technical Training Academy in Milton Keynes in five specialist categories, for Service Technician, Parts Advisor, Panel Technician, Paint Technician and MET (Mechanical Electrical and Trim) Technician Apprentice of the Year. In addition to John Deere, some of the UK’s leading vehicle manufacturers and fleet providers were represented including Audi, BMW, Fiat, Mazda, SEAT, Skoda, Royal Mail Group and Volkswagen Paint and Body. The Babcock Service Technician Apprentice of the Year Award went to Charlie Phipps of John Deere dealer Farol Ltd, Milton Common, Oxfordshire, while Babcock Parts Advisor Apprentice of the Year was awarded to David Lambert of Burden Bros Agri Ltd, Stockbury, Kent. In addition, Michael Maxwell of Tallis Amos Group, Evesham, Worcestershire was placed third in the service technician category. Various service or parts and customer related tasks were set up to test the skills, methodology and processes of all the candidates within set time frames. 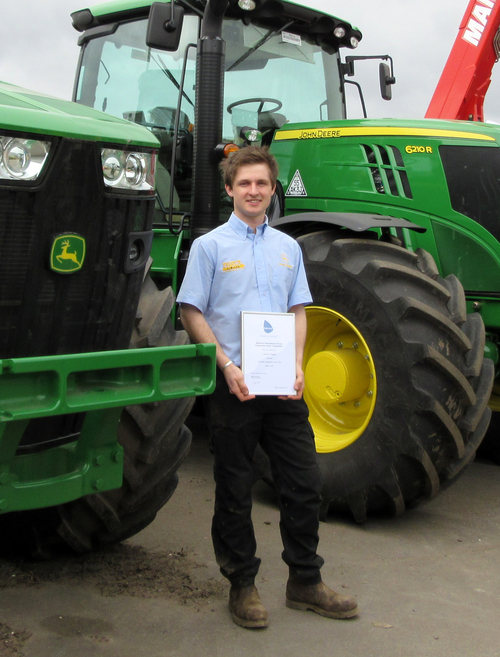 While each apprentice was assessed on their own specialism, they were truly tested by working with vehicles that were not from their own brand – which meant the non-John Deere apprentice service technicians were faced with a tractor in one of their seven tasks. The winners of each specialism received a framed certificate and Samsung tablet, while the overall winner of the Babcock Automotive Apprentice of the Year Award for 2015, Matt Savage from the VWG Paint and Body network, also received a trophy and a year’s membership to the IMI (Institute of the Motor Industry, the industry’s awarding body for national apprenticeship programmes). The awards were presented by IMI business development manager Michelle Barrett and Babcock’s office manager and event organiser Kirsty Grant. Babcock has been delivering John Deere’s apprentice training since autumn 2010. The Ag Tech service technician programme started in 1992 and was the first such scheme to be introduced in the UK. It won a National Training Award at the end of 1997, the only one ever made to an agricultural machinery apprenticeship programme.